A broad-spectrum residual insecticide. 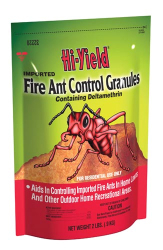 Controls Ants, Armyworms, Bermudagrass Mites, Billbugs (adult), Boxelder Bugs, Centipedes, Chiggers, Clover Mites, Cockroaches, and many others listed on label. Treat once a month as directed when pests first appear in late spring (May - June) and continue until late summer (September - October). Apply two tablespoons over each 8" to 10" diameter mound and up to 2 feet around to prevent escape of the queen. Immediately after application, water the granules into the soil gently with a light sprinkling can to avoid disturbing the colony. Use at least one gallon of water per mound. Apply in cool weather during the spring and fall (65-80°F) or in early morning or late evening for best results.